We are working towards forecasting earthquakes based on magnetic pulse patterns and air conductivity changes similar to those patterns observed prior to previous earthquakes. The only recent earthquake near one of our sites was Anza in southern California. Even though we thought the magnitude would be too small to detect, we did see some similar patterns. The Anza quake was a M 4.7 on Tuesday, March 11th at 08:55:42 PDT located approximately 13.4 miles S.E. from our Anza site (869). Our hypothesis, based on experience, is that we should see some indications if the quake is greater than M5 and located within a 10 mile radius. Therefore, we see this as a marginal quake. The site equipment was healthy, so we looked at our Exp5, Exp7, and qf1 algorithms where each algorithm has slightly different amplitude threshold and pulse finding characteristic. The quake is the diamond in the upper right, and the most sustained signal (2 days) starts at -16 to -15 days prior to the quake. 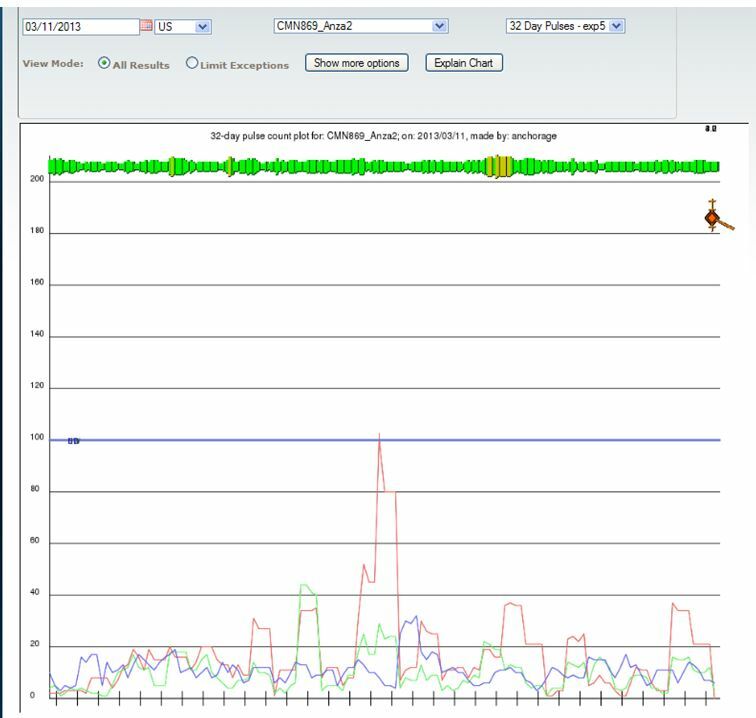 Each tick mark on the X-axis is one day in this 32 day plot. If the quake had 4-5 days of sustained activity, it is considered to be a more reliable indicator (and usually occurs prior to a larger quake). The signals were analyzed over several weeks, and several unipolar pulses were found. As an example, the 3 taller pulses in the plot below, are mostly positive in direction (“unipolar”). There were also several very long pulses in the data during February 23. The Kp worldwide magnetic index was very quiet during the same time. None of the sites near Anza saw the same long pulses (indicating that they were not from world-wide, solar-magnetospheric disturbances) therefore, the source of the long pulses may be associated with the area near the earthquake (tbd). The air conductivity sensor is examined for the 48 hours prior to the quake. 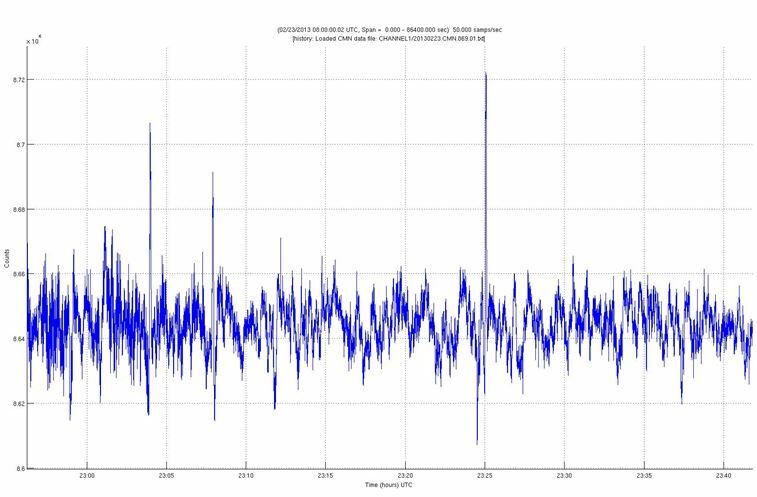 No positive ions activity showed for 30 days prior to the quake, and the sensor appeared to be working (as shown by the hourly calibration signal in the data). We would expect to see some positive ions within 48 hours of the quake if the site is close to the epicenter. The negative ion detector can be “fooled by rain”. There was no rain during March 10 and 11 (but there was some on Mar 09), so the relative humidity (a contaminant) is good for March 10-11. Neither the positive or negative ion sensors showed signals those days. However, there is activity on the negative ions for Mar 09, but that is due to evaporating water on the ground from rain on that day. Why wasn’t there a positive indication within 48 hours of the quake (as seen on previous quakes)? The prevailing winds are from the west, so if the ions were generated at the epicenter, they would not drift against the oncoming wind to the Anza ion sensors. Borrego Springs is the next site to the southeast in the wind path, unfortunately it was off line. We have sent a technician to the Borrego site and are trying to determine if the site was recording data and had simply lost cell phone communication. Summary: This is a marginal quake (size and distance from the epicenter) but there is a small pulse count indication observed at -15 to -16 days with smaller rise in counts at -1 and -9 days. It was difficult to pick this out from the normal patterns, but the longer (20-40 sec.) pulses may provide some insight into the quake generation process.